The Karner blue (Plebejus melissa samuelis) is an endangered subspecies of small blue butterfly which was once found in significant numbers in the Miller section of Gary, Indiana community of the Indiana Dunes National Park. The butterfly is now mainly found in other parts of the Great Lakes states, such as Wisconsin and Michigan, in small areas of New Jersey, and also in southern New Hampshire, and the Capital District region of New York. The butterfly, whose life cycle depends on the wild blue lupine flower (Lupinus perennis), was classified as an endangered species in 1992. In May 2000, the Canadian Species at Risk Act listed the Karner blue as being locally extinct in Canada. This subspecies of Plebejus melissa was described by novelist Vladimir Nabokov. Local conservation efforts, concentrating on replanting large areas of blue lupine which have been lost to development (and to fire suppression, which destroys the open, sandy habitat required by blue lupine), are having modest success at encouraging the butterfly’s repopulation. 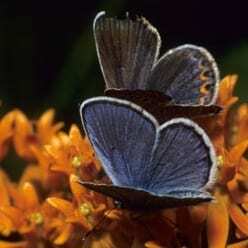 The Karner blue is the official state butterfly of New Hampshire. The Necedah National Wildlife Refuge in central Wisconsin is home to the world’s largest population of Karner blues, which benefit from its vast area of savannah and extensive lupine. The Karner blue was first identified and named by novelist and lepidopterist Vladimir Nabokov. The name originates from Karner, New York (located half-way between Albany and Schenectady) in the Albany Pine Bush, where it was first discovered. Lupine blooms in late May. There are two generations of Karner blues per year. The first in late May to mid June. The second from mid-July to mid-August.